Just became a sponsor of the TEP Gumbo Contest. The 7th Tennessee Equality Project Gumbo Contest presented by Hilton Memphis will be held on Sunday, February 19, 2017. 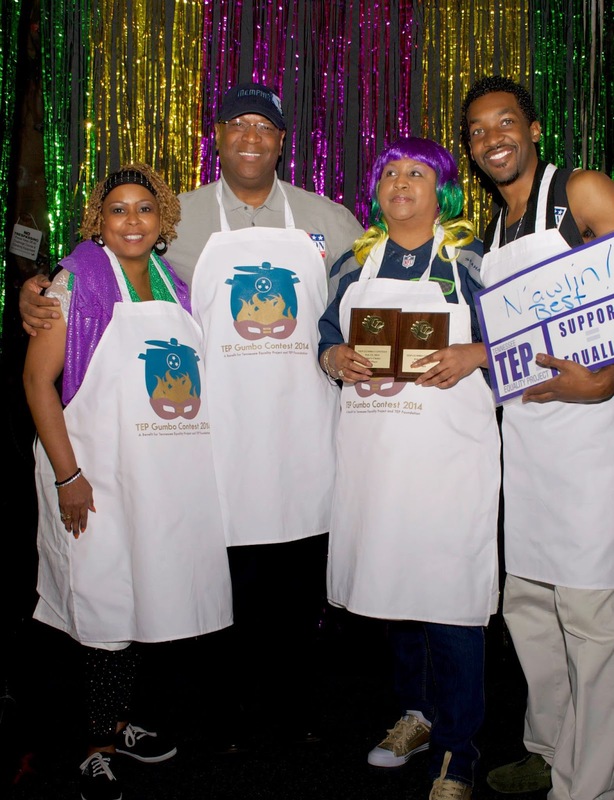 TEP's annual Mardi Gras celebration brings together teams from the Western, Middle and Eastern United States to compete for the best gumbo in Memphis. Gumbo contestants will be awarded prizes by an appointed panel of judges and by individual tasters like you in the People’s Choice competition. TEP is grateful for the generous support of its presenting sponsor for 2017: Hilton Memphis! If you choose a Flaming or Hot sponsorship, you'll receive instructions for choosing your VIP Table (1-9 or A-G). Table choices will be processed in the order they are received. Sponsors will receive tickets by mail to the purchaser within a few weeks of the event. Hilton Memphis is the Presenting Sponsor for the 2017 TEP Gumbo Contest. VIP Table (8 seats) with complimentary King Cake (while supplies last). After making your sponsorship donation, you will be prompted to choose a VIP table nearest the stage and dance floor. NO LONGER AVAILABLE BUT WILL RECEIVE 8 GENERAL ADMISSION TICKETS. Learn more about the issue and consider signing the petition to add your voice to this call to action. This week the Southern Baptist Convention's Ethics and Religious Liberty Commission is holding a conference in Nashville on marriage, sexuality, and gender. Add your voice to urge them to consider the impact of their teachings on violence against LGBT people and LGBT youth homelessness. According to national estimates, up to 40% of the youth homeless population is LGBT. Many of those youth were turned out of their homes because of certain kinds of religious bias. We believe that rather than holding conferences on how to preserve marriage discrimination, the Southern Baptist Convention's leadership should begin to address the ways in which their teachings contribute to harms to LGBT people. TEP joined OutCentral and Vanderbilt Divinity School in organizing a protest of the event outside the Opryland Hotel. TTPC and PFLAG also participated. Your voice can help highlight needed changes in the Southern Baptist Convention's approach.